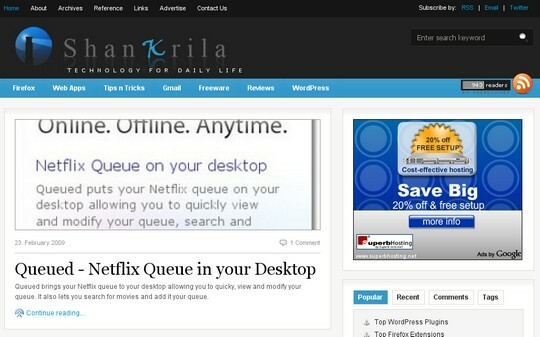 ShanKrila has gotten a re-design and the new look is live on the blog now! I had used a highly customized Saur WordPress 3-column theme for a long time. I loved it and had a green/orange/white color theme going on representing the Indian flag. As much as I loved it, the theme had gotten too busy for my taste. There were too many things in the sidebars and footer. 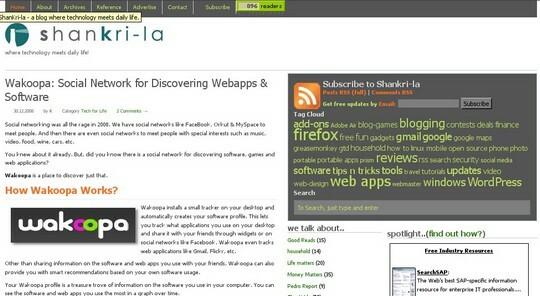 I had wanted to move to a 2-column theme for a while but never really found one that I could see ShanKrila in. Finally, I won a copy of Fresh News by @adii in a contest and I was in love with it. The only problem was I loved the logo I had but it was in a green/gray shade and the new look I was going for called for a blue theme. Also, if you had wondered about the logo.. ShanKrila aims to be a shining beacon in this ocean that is the Internet focusing just on the gems that I share with you. Sounds like a cliche? It is. That’s when my good friend Suren offered to help (meaning I dragged him kicking & screaming into this.. just kidding buddy!). As you can see, he masterfully re-did the logo to fit this theme like a hand in a glove. And the fun looking K in ShanKrila, yes sir, that’s me! 😉 If you are reading this in a Feed reader, I invite you to click over and take a peek and offer some feedback in the poll and/or comments. Dumped categories & use tags for main navigation. New translation engine for different languages – I love everyone! Twitter integration in comments – you can leave your Twitter ID while you comment and gain more exposure. It’s 2 fold – I can find you on Twitter and so can other readers. Go ahead, try it out. Minimal ads for regular readers – ads appear only after 7 days of publishing or if you came here through a search engine. I hope you don’t mind the others as they really help run this blog and make it better. Amazon integration – right now the blog sidebar has contextual Amazon products. I am in process of building ShanKrila’s Amazon Store – this will feature products I love & recommend to my friends. You can see the browse my favorite books, electronics, home stuff, gadgets, laptops, etc in the upcoming Amazon store. As you might have noticed the message in the Comments area, I have made a hard decision to discontinue being a DoFollow & KeywordLuv blog. I have been a DoFollow blog for almost 2 years now. I have benefitted and have shared this benefit with countless others. Plus, I was also sold to Stephen Cronin’s idea of KeywordLuv and have had it over 8-9 months here. One thing that has grown to be a problem is that I am now listed on way too many DoFollow/KeywordLuv list of blogs. I am guilty of voluntarily asking to be added to some of these lists. Getting down to why I made this decision – I simply want to have a conversation with my readers. A real conversation. But, the comment sections have become unmanageable with the flood of comments from Internet Marketers. I have nothing against marketers but everyday my motivation to reply to comments have been waning and I have lost the enthusiasm to reply to comments where there is 100s of comments to moderate every week. It gets tiring. And I often see that I had missed replying to a genuine question or concern from a reader whom I could have helped in a timely manner. I have not become too big to discontinue this. I only see this blog as an extension of me and I don’t like to see that it has become a one way street where I post and disappear. As with any other blog, the real value is in the comments. And the I would like to continue the conversation beyond the post whether you agree with my post or not. However, I have CommentLuv – which shows your most recent post from your blog when you comment. Plus, the Twitter integration could help finding people with similar interests by checking out the comments or leaving yours as well. Other bugs that I am not aware yet – please leave a comment if you found something broke in the site. Google Adsense has been the main support for this blog so far and private advertising hasn’t been much of a contributor. But, that’s becuase I honestly haven’t pursued it as much as I should have. I hope to change that. I am also interested in seeing what kind of effect the re-design is going to have on Adsense earnings. I just want to say thanks to all my readers for motivating me to go that extra length. And to those readers who have loyally left comments because you wanted to converse, I am back. And I look forward to your comments. Great Design buddy. The new theme looks much cleaner and simple. Even i am planning a new design for my blog soon. Will go for a two sidebar theme as well. Barring the Advani Ji ad, everything right now looks fantastic!! Looks great! I might suggest that the top line of type in your updated logo could use just a little kerning to tighten it up. I’m not a big fan of having to click “Continue Reading…” link at the bottom of each entry from the main page to read the full post, but it seems that’s more and more the norm, so maybe I just hafta get used to that. The overall design is stylish and clean, but the right-hand sidebar still seems a bit large. I’d rather see more of the page devoted to the actual current content. Madhur, thank you so much buddy! Look forward to seeing your new design. Ankit, thanks for your feedback here and on Twitter. Looks like the mention of Indian flag in the post attracted the Advani ad. 🙂 Sorry about that. Rob, I don’t even know what kerning means so I’ll just pass that on to my friend who designed it. 🙂 It’s true blogs have been moving away from displaying 10 full posts in the first page and I myself hate clicking through every link as well. But, with most visitors coming directly to single posts either via feed reader or search engines, a home page of this sort help convert new readers into regular readers if we can concisely show what the blog is about. A sort of landing page to get a reader interested in your blog, if you will. So it has to be concise and attractive to achieve that. Anywas,looking forward for reading lots of interesting content as always!! So, I’m just suggesting that you tighten up (or reduce) the spacing between the “S h a n” and the “r i l a” which may make the swooshy “K” pop out even more. But really, this is trivial – I like your new design! Nice new theme. I always love any color in the variant of blue. I would love if you can work on the header and the logo image. But looks like some like the header image. Ankit, true! Now that this re-design is out of the way, I will back to blogging full steam. Rob, makes sense. In fact, I added the byline after the logo was designed. So I might try to get my buddy Suren to do your suggestion as well as add the byline in the logo itself so they line up better. Thanks for the suggestion and encouragement. Joel, thanks! I happen to love the logo as well but I agree it can be lined up better. I like the new design, its easy on the eyes and logically organized. Very classy design, like it a lot. Know what you mean about he comment spammers too, they’ve absolutely ruined one of the best bits about blogging. Nice theme buddy, definitely love the new look, especially the logo, looks pretty good. Hello! I haven’t been commenting on this site for quite a while and I have a new gravatar and blog, so you probably don’t remember me. You did stumble this to me though (I’m ui0man). However, I do like the new design. At first glance I didn’t like it, but I do think it better suits the site and content. It is much cleaner as well. I also like that it doesn’t look overly bloggy if that makes sense. I can definetly respect your decision to no longer be nofollow. I think that if you do do it, you shouldn’t advertise it so openly and you’ll be fine. Keith, thanks buddy. I’ll pass that on to my buddy who did it. Jake, thanks for taking the time to say hi! It’s nice to put a name to the SU id. 🙂 Plus, the twitter integration is already paying off as I can connect with you further there as well! I know what you mean by ‘not too bloggy’. 🙂 Appreciate that as well. @K: Yes, the Twitter integration seems like a fine idea. I’ll warn you that not all of the Jawee’s are me. I probably need to stop using different names at different places! Anyway, I look forward to reading your blog again. I haven’t been except when you occasionally stumbled stuff to me. New theme looks great! Especially that logo. Your inspiring me to redesign mine again – although I’m too busy to seriously consider it. As for the SEO effect of not being Dofollow, it will be interesting to see how it affects your search traffic (although the theme change may also have an effect). I’ve said previously, my search engine traffic has grown steadily, despite being DoFollow and using KeywordLuv, and I’ll stand by that. You should see an increase in PR, but it’s only a small part of ranking in the SERPs these days – and there’s talk (unverified) that the search engines are starting to look at social ‘signs’ such as how many comments you get in terms of deciding how popular a site is. Anyway, let me know what you find! Thanks. I like the new design … very attractive and easy to read. As for the dofollow/keyword luv, I know how you feel. I think you make enough useful posts, that you should still get plenty of comments anyway. Stephen, thanks for the compliment and I’ll pass on the logo comment to my friend Suren who did it. I’d love to see your re-design as I know you have some serious design skills as well as coding skills. I haven’t been able to tell a difference since for a week I missed adding Google Analytics code to this theme after the re-design. So, I will get some grasp of it by the end of this week as to search engine traffic. But, my Adsense earnings seem to be slightly better since the re-design. Again, it could be for some other reasons too. I might get the DoFollow back and not advertise it like before sometime down the line. It makes sense that Google’s PR would take effect more social metrics like the number of comments, RSS feed count, etc when it comes to ranking blogs. We’ll see how that transpires. Again, thanks for your input. I highly value it and probably would get others here thinking as well. Good job on the new design, am really liking the new look and features! The new design looks good. Wish u luck. Change is the only thing that is permanent in life. Hmmm! Profound! But let me add a comment now about KeywordLuv. In short, I love it. It’s been making a fantastic difference in my search engine rankings and therefore in the money. I’ve been recommending it to every WordPress blogger I know. Hi, I noticed that you have CommentLuv installed on your blog. This is a great plugin! I have installed it on my blog as well. So far the results have been amazing, although there are a few people out there(blackhatters) who have chosen to use this plugin for evil. But overall, it is one of the best plugins I have installed on my blog thus far! I look forward to reading more from you in the future! .-= Jared´s last blog ..What Is Black Hat Search Engine Optimization (SEO)? =-.